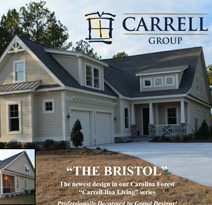 Easter weekend was a great time to visit Myrtle Beach…and visit our newest model home… “The Bristol”. If you didn’t recieve an invitation to our open house, you can visit this model home at your convenience. It is typically open and staffed with a Carrell Group team member everyday of the week. However, we suggest if you are making a trip from outside the area, you contact us to arrange a tour (800-533-2393). The Bristol is a beautiful example of “Coastal Cottage” architecture…and is furnished and accessorized by our talented team at Grand Designs. This home is also one of our best values when evaluated on a “cost per foot” basis. We have already had multiple requests to replicate this home in other communities…and it is particularly well suited for narrow homesites. Visit us soon at The Bristol!